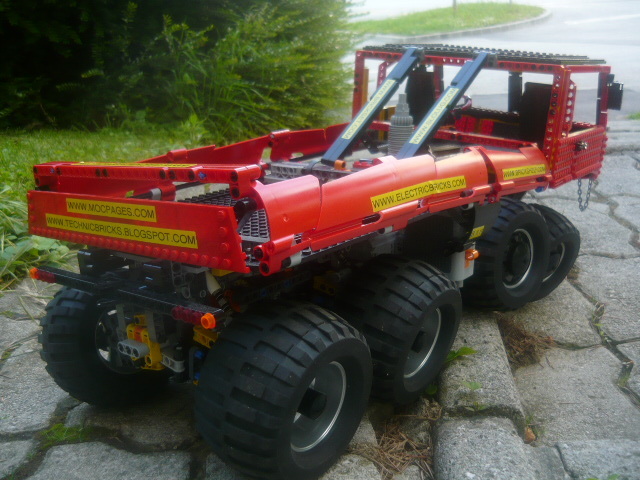 Long time ago we at TBs realized on a BS folder where Zblj (Jernej member of Kocke Klub, the Slovenian LUG) had photos from his Tatra 8x8 Trial Truck, taped with the URLs from some LEGO related websites (mostly well known ones). It was with a big surprise and satisfaction that we saw also the TBs URL there. Because ads have to be paid... , since then I had it also on my slow post queue and have been looking for something special from Jernej to highlight here. Today I've decided for his attempt to build an LEGO automatic gearbox. It is not the first time we write here about automatic gearboxes , but this one uses a different principle. In fact it looks more like a CVT system (Continuous Variable Transmission), despite its narrow sensitive margin as it seems to switch quite fast. It is a simple automatic gearbox design, using 2 differentials and a couple of gears. Based on Jernej explanation here it goes how it functions, in simple words. Differentials always slips to the easiest side. The left side has friction and the right doesn't. This means the power normally goes to the right. But when the load becomes higher than friction on left side, the power is sent to left side, where there is a higher gear ratio. 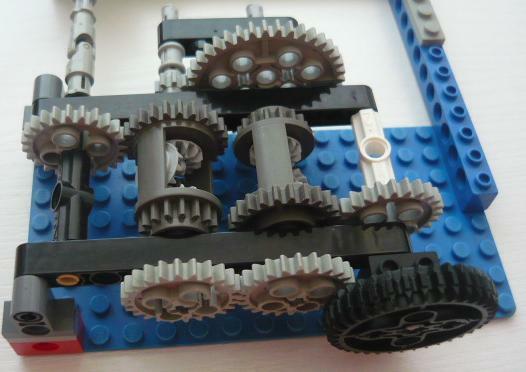 Total gear ratio varies between 1:1 and 5:1 (the ratio between the gears on the left side). You will find it at this BS folder. A good demonstration for the used principle, rests to know whether it can shows effective at up/down-shifts, into a real Technic vehicle or not. I tried to make it smaller, but not quite successful yet. Thank you very much for presenting me and my models! I will have more stuff at the very end of the year! So the ratio depends on the relative loads of the output black gear against the friction of the 8:40 axles and their grey bush pins in the black studless beam. Nice and tidy! There's quite a family of torque-splitting gearboxes, using differentials or z56 turntables as epicyclic stages. I did one last year with a Hailfire Droid wheel! You could use alternative variable loads with this, as an auxiliary function for a vehicle, perhaps an air compressor* or a motor (as a generator) with switched lights, driven by the 8-tooth cog shaft. No chance of wearing the grey pins then! * an air compressor could have an air tank to accumulate the pressure, increasing the gear ratio as the air pressure increased. It could have an air pressure limiter to limit the torque, and a valve to release the pressure, which would be like changing down a gear as the load on the compressor was reduced. I'll have to try it! Yeah i ahve been thinking to use something other than pins, but i wanted to use a motor and a some lights to provide necessary friction. But if the gear ratio depends on the balance between load and friction, I guess it means that you will lose a lot of power due to friction when you have high load on the black gear? Yes, there is some power loss in lower gear. But you can use that power by replacing friction pins with something like a compressor, or electric motor which powers up lights. I have built something similar to this before but I did not like the friction power loss. I thought about storing the energy so that it could be returned to the drive when the resistance lowers, say by winding elastic. unfortunately I haven't had the time to actually build this yet..